A Hunter Digimon that was originally a Virus Digimon, but was converted to a Vaccine by a mutation. 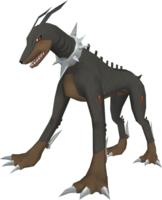 Similarly to Snimon, it is a brutal Digimon that exists solely to hunt Virus Digimon despite being a Vaccine, and it can't be controlled by an ordinary Tamer. 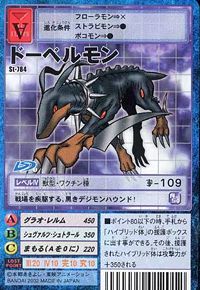 Its Special Moves are a howl that seals the opponent's abilities (Grau Lärm), and a black beam that pierces the opponent's body and destroys its Digicore (Schwarz Strahl). n., From Dobermann Pinscher 「ドーベルマン・ピンシャー Dōberuman Pinshā」, alternatively and more commonly spelled as Doberman, a breed of dog originating from Germany, named after Friedrich Ludwig Dobermann a 19th century dog breeder. Anime/Manga Digimon Tamers: "The Mysterious Girl! 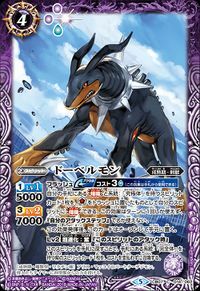 The Bringer of Miracles Dobermon"
Grau Lärm  Grey Noise グラオ・レルム Gurao Rerumu A roar that seals the opponent's power. Schwarz Strahl  Black Beam シュヴァルツ・シュトラール Shuvarutsu Shutorāru Fires a black beam that penetrates the opponent's body, destroying their Digicore. 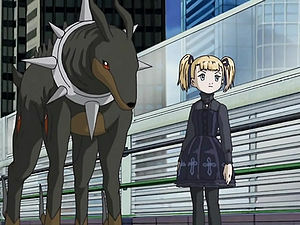 Dobermon was the partner of Alice McCoy. 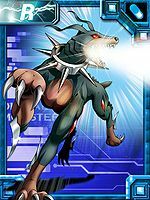 He was an emissary from the Four Holy Beasts to give the Tamers the ability to Matrix evolve with their Digimon in the Real World. A Dobermon was seen at the Akiba Market. Dobermon is the partner of Mashimo Hideaki. 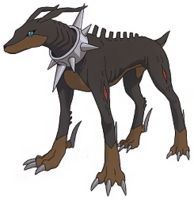 Dobermon is available as a Digimon Medal. 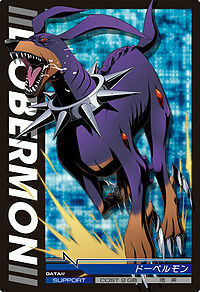 Dobermon is available as a Digimon Card. Evolves from Gabumon, Bearmon or Hawkmon with Penalties +2, Training in morning. 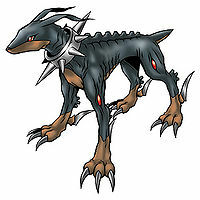 Can evolve to Delumon, Garudamon X-Antibody, Grappleomon, or Were Garurumon X-Antibody. Can also Jogress with XV-mon (1.0), Angemon (2.0), Aquilamon (3.0), or Thunderbirmon (D-Scanner 3.0) to evolve into Mihiramon. 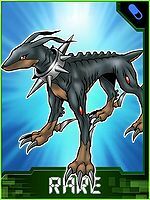 Evolves from Commandramon, Dracumon, Gizamon, Hagurumon, Penmon, or Tentomon when you do not fulfill the requirements of other Digimon. Can evolve to Tankdramon, Volcamon or Scorpiomon. 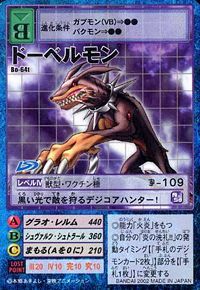 Can also Jogress with Sealsdramon to evolve into Tankdramon. 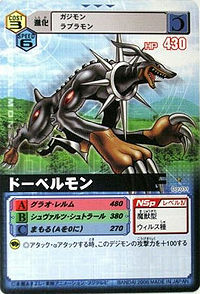 This black Digimon hound sprints across the battlefield! To the average tamer, it is an uncontrollable, ferocious hunter digimon! This Digicore Hunter hunts its enemies with its black light! 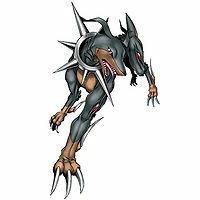 A brutal hunter Digimon that was formed when a Virus Digimon underwent a sudden mutation to become Vaccine attributed. It acts solely on its instincts that lead it to hunt down Virus Digimon. Alice McCoy's Partner Digimon. 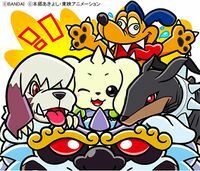 It entrusted Takato and the Tamers with the Four Holy Beasts' power. ↑ Digimon Xros Wars: "Taiki VS Yuu, The Confrontation of the Boy Generals!!" 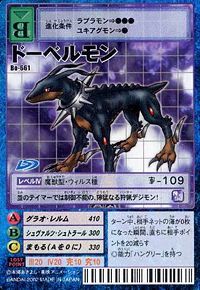 ↑ Digimon Xros Wars: "The Final Kingdom, The Shining Sun's Bright Land"
↑ Dobermon was adopted from a winning Digimon entry in the V-Jump Contest. This page was last modified on 14 April 2019, at 01:02.